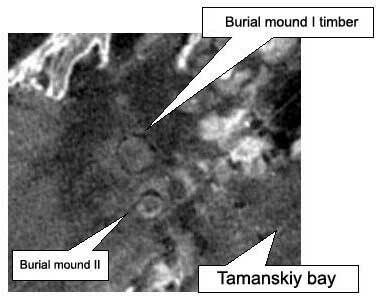 GPR cross section of the island situated at the place where possibly the tsar Satir monument had been situated. The Chushka spit, Tamanskiy bay, The Black sea. A round island has attracted our attention after the decoding of the spacephoto of the Kerch gulf region and the Chushka spit. The island had a regular geometric form. It diameter is about 100m. Attachment of the object form the spacephoto to the geographical coordinates demonstrated that the island is situated at the point, which was identified in the Strabon's "Geography" as the tzar Satir monument -'...the burial mound, raised on the cape in memory of one of the famous Bospore sovereign. In expedition of 2003 we found this island among a huge number of islands on the shallow part of the south-west end of the Chushka spit. To continue our investigation we laid a route through the centre of the island to the South-North direction. The results of our investigations were much more than we had expected. In the central part of the island, dispalced to the South a bit, an object is situated. It has a rectangular form about 6m. in size. The lower level of the object is 5-6m. depth. The object is situated in the centre of rectangular structure, like a wall "partition" 20x20 in size. In expedition of 2004 we a going to conduct the more detailed investigation of the object.